If you are compassionate, detail-oriented and love working with people, nursing may be the perfect career for you. The Vocational Nursing Program at High Desert Medical College (HDMC) is a great place to begin and you can complete our full-time program in little over a year. Our nursing programs include a combination of classroom study and clinical practice in a hospital or other healthcare setting. Both Bakersfield and Lancaster campuses are enrolling for upcoming Vocational Nursing classes. Book your appointment today. 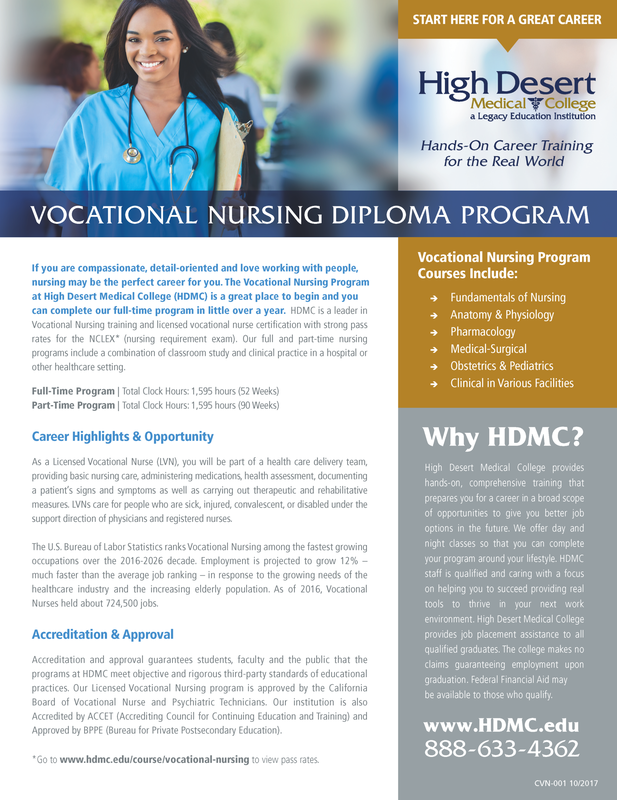 HDMC is a leader in Vocational Nursing training and licensed vocational nurse certification with strong pass rates for the NCLEX* (nursing requirement exam). Click here for HDMC NCLEX pass rate for those tested during Quarter 3– 2018 (July 1, 2018 – September 30, 2018). California and National pass rates are listed below. California’s Quarter Pass Rate for First-Time Program Candidates during Quarter 3 – 2018. was 77%. California Average Annual Pass Rate for First-Time Program Candidates for Quarter 3 – 2018. was 76%. National Quarter Pass Rate for First – Time Program Candidates during Quarter 3 – 2018 was 86%. National Average Annual Pass Rate for First-Time Program Candidates for Quarter 3 – 2018 was 85%. As a Licensed Vocational Nurse (LVN), you will be part of a health care delivery team, providing basic nursing care, administering medications, health assessment, documenting a patient’s signs and symptoms as well as carrying out therapeutic and rehabilitative measures. LVNs care for people who are sick, injured, convalescent, or disabled under the support direction of physicians and registered nurses. The U.S. Bureau of Labor Statistics ranks Vocational Nursing among the fastest growing occupations over the 2016-2026 decade. Employment is projected to grow 12% – much faster than the average job ranking – in response to the growing needs of the healthcare industry and the increasing elderly population. As of 2016, Vocational Nurses held about 724,500 jobs. Accreditation and approval guarantees students, faculty and the public that the programs at HDMC meet objective and rigorous third-party standards of educational practices. Our Licensed Vocational Nursing program is approved by the California Board of Vocational Nurse and Psychiatric Technicians. Our institution is also Accredited by ACCET (Accrediting Council for Continuing Education and Training) and Approved by BPPE (Bureau for Private Postsecondary Education).